Kids all over America are looking forward to the summertime. There’s no school, no homework and they get to stay up later. There’s also the promise of long days spent swimming and playing outside. Unfortunately, summer is also the time when the most trouble occurs. According to the National Safe Kids Campaign, a large amount of ER visits occur during summer months when kids aren’t in school. Most of these injuries could have been preventable. 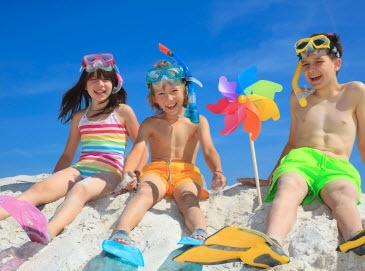 Here are five safety tips that you need to teach your kids about safety during summer fun. Every year, thousands of children are injured and in pool-related accidents. In most cases, these incidents are caused by drownings or near-drownings that occurred with unsupervised pool use. It’s extremely important to speak with your children about the hazards of swimming without a responsible adult present. Furthermore, it’s a good idea to emphasize the use of pool safety rules and equipment. Don’t run, use ladders properly, don’t dive in shallow areas, make use of floatation devices and get out of the pool when tired. Most kids are taught at an early age that they should be wary around strangers. However, just telling them to stay away from strangers can be vague and confusing, so be specific. Tell them to say no to offered rides or other suspicious invitations. They should also be taught never to open the door for anyone when a family member isn’t home. Summertime means time for cookouts and picnics. Unfortunately, it can also open up the risk of illness caused by bacterial contamination. Germs like salmonella and E. coli flourish in warm temperatures. Remind your kids that good hand-washing practices are important for protecting both themselves and the people around them. Also caution them against eating foods that have touched the ground or another unclean surface. When kids are having fun, they can lose track of time or may not want to go inside. Unfortunately, this also increased their risk of suffering a dangerous heat-related condition like heat stroke. Let them know that they need to go indoors when they start feeling too hot. They should also know that it’s important to stay hydrated. Sunburns can be as dangerous as they are painful. Make sure your child knows to apply sunscreen before going outside and to reapply it as often as needed. In addition, spending more time playing in shady areas can help to minimize the risk.